I will always have a weakness for a good Cuban bar and restaurant. I don’t know if it’s something in the music, the rum or the spicy food that just pulls me in time and time again. 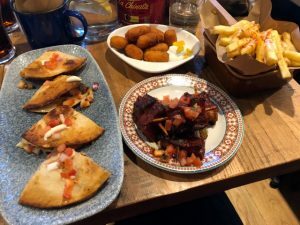 So when SHARP was given the opportunity to go and review Revolucion de Cuba’s new lunch menu, we jumped at the chance. The massive three-floor venue that replaced the former Luna and Destiny nightclubs in the Cloth Market, has been open for just over four months and is already packed out every weekend with party-goers and diners alike. 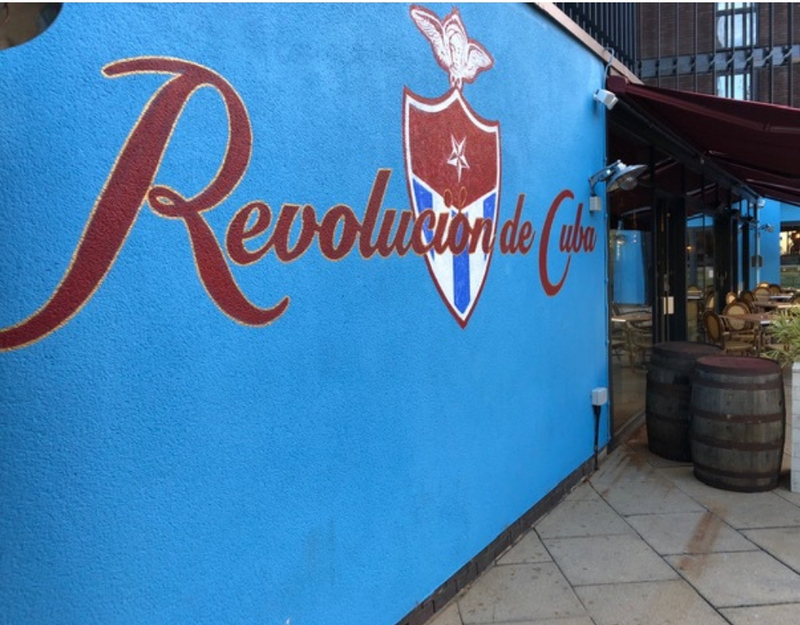 The underground Havana Club, complete with a stage, party booths and terracotta walls propels you straight into 1940’s Cuba, whilst up on the roof-top terrace you can enjoy a cocktail with the comfort of the roof cover and heaters, keeping the geordie Winter at bay. Anywhere that offers tapas is a definite winner in my book and with the offer of 3 for £14, we couldn’t resist, between the two of us we had patatas bravas, smoky chicken skewers, two portions of chicken quesadillas, chorizo croquettes, pork belly skewers and also some of the cheesy cuban fries to go with it. However I can’t not mention the main lunch options we were also tempted by. 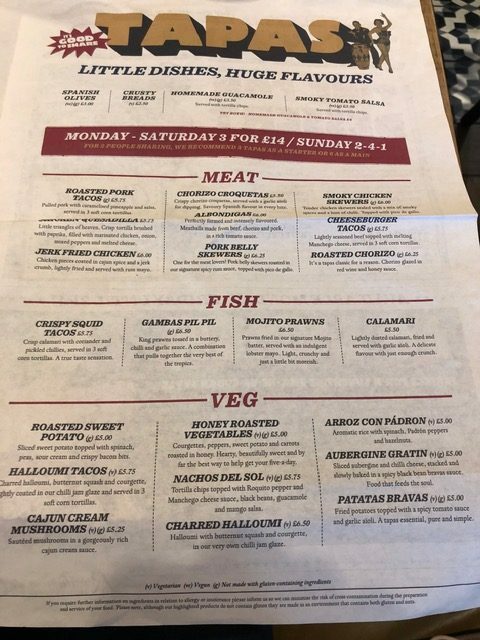 Coming in the form of full meals with sides were burritos, grilled swordfish, caribbean chicken curry, paella and a choice of burgers, including a hand pressed quesadilla burger! It was so difficult to choose. We were pretty boring and had diet cokes because it was the middle of a work day, but the cocktail menu is vast and full of interesting concoctions particularly rums, so it’s so worth checking out. The food arrived within 10 minutes (we weren’t the only ones in the restaurant either, there were around 8 other lunch tables) and came piping hot. The flavours were amazing and for three tapas plates you get a lot of food. (Hint: the patatas bravas are probably better off as a plate for two, but I still managed to polish them off myself.) The quesadillas were cooked to perfection and the chorizo croquettes had that little kick to them without burning your mouth off. We were in and out of the restaurant in under an hour, not because we were running away, but the food came so quickly and it was naturally time to leave. Perfect for a quick lunch break before getting back to work. 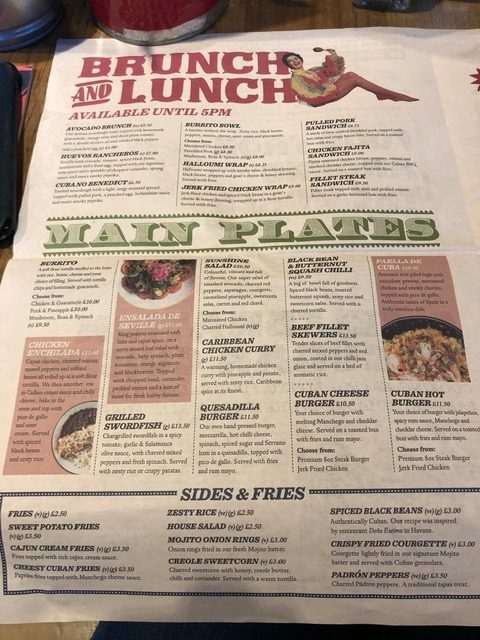 Similarly there were two businessmen sat next to us who extended their lunch and went to sit on one of the long tables to go through sets of papers. Because there’s no overpowering music it’s the perfect place for a catch-up. I could not recommend it more for a mid-week treat. 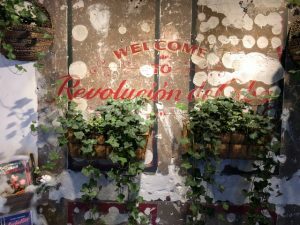 Whether it’s a lunch bond with a colleague or a corporate lunch, everyone is made to feel welcome by Revolucion de Cuba. To learn more or to book a table visit the website.